The Baltimore juvenile female as spotted from the window of a DCR office in downtown Richmond. Courtesy photo. Two peregrine falcons were spotted in downtown Richmond on August 1st, including a new banded juvenile female from Baltimore, Maryland. The new female falcon perched by the windows of the Department of Conservation & Recreation’s (DCR) office where a few observers were able to capture photos of the bird and get a read on her bands, helping Virginia Department of Game & Inland Fisheries (DGIF) to track down her identity. The juvenile was one of a clutch of four peregrine falcons that hatched April 26 – April 30 of this year on Chesapeake Conservancy’s Peregrine Falcon Camera, which has about 3.3 million followers and is operated with support from Explore.org. 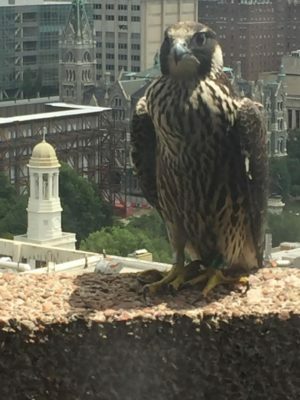 Their nest cam is located on the 33rd floor of the Transamerica building in downtown Baltimore, which has served as a home for a pair of falcons for nearly 40 years. A raptor biologist with U.S. Fish and Wildlife Service banded this juvenile female on May 25, 2018. Known as Kelani by Chesapeake Conservancy, her black and green bands are numbered 93 and AK, respectively. Her silver USGS band number is 1907-03424. It is unknown whether Kelani’s arrival in Richmond may be temporary or longer term. In early August, juvenile peregrine falcons are typically dispersing, so she may just have been passing through as part of that process. Although, since she was also spotted with another peregrine falcon, that second bird may have been the male featured on DGIF’s Richmond Falcon Cam, which could potentially indicate the start of a new pairing, but this possibility is really just speculation since we do not have confirmation on that second bird’s identification. We thank the DCR staff for sharing their observation with DGIF and Chesapeake Conservancy for providing additional information about the juvenile female and her origins. The sighting of this Baltimore-born falcon in Richmond piques our interest going forward into next year’s Falcon Cam season and it’s an enthralling illustration of the connections between our wildlife in the Chesapeake Bay watershed. 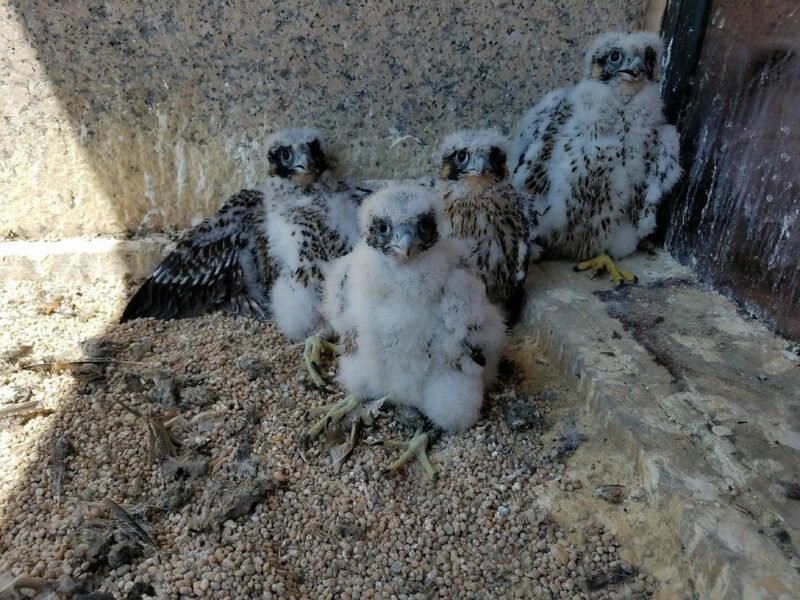 Baltimore peregrine falcon chicks on May 25, 2018, the day they were banded. Photo by Craig Koppie, USFWS. The Chesapeake Conservancy’s Peregrine Falcon Camera, is actually one of three webcams they operate in the Chesapeake Bay watershed, all of which are supported by Explore.org, and have a combined 10 million visitors. Each of the three cameras, great blue heron, osprey, and peregrine falcon offer a unique look into the life of beautiful wild birds living in the Bay watershed. DGIF’s Richmond Falcon Cam, sponsored by Comcast Business, has over 90,000 followers. It is located atop the Riverfront Plaza’s West Tower in downtown Richmond where the same male peregrine falcon has nested since 2006. He will be 19 years old in 2019! Look for the cam’s next season to start up in March of 2019. This article is an updated version of the article, “A New Female Falcon in Town,” which was originally published to the DGIF Richmond Falcon Cam blog on August 6, 2018. DGIF updated this article after additional information became available.